A Quantal aluminium orangery is the ultimate in extended living space, offering a unique and comfortable environment that will expand and enhance your home and the life you live in it. Whatever you intend to use your orangery for – be it for entertaining, relaxation or simply for living – our unique designs can be adapted to match your requirements. You can make your orangery a seamless addition to your home or a complete contrast – we have the expertise and the capability to build your vision and make your dreams come true. Every glass building we supply is covered by a comprehensive warranty, and is guaranteed to weather the worst of the winter while looking fresh and new, year after year. An Ultraframe orangery is a space you can live in all year round. Thanks to our ingenious roof insulation, your new living space will stay cool in the summer and be warm and dry during the colder winter months. This means your new room can be used for any purpose – entertaining friends or family, or simply for sitting in while reading a book. 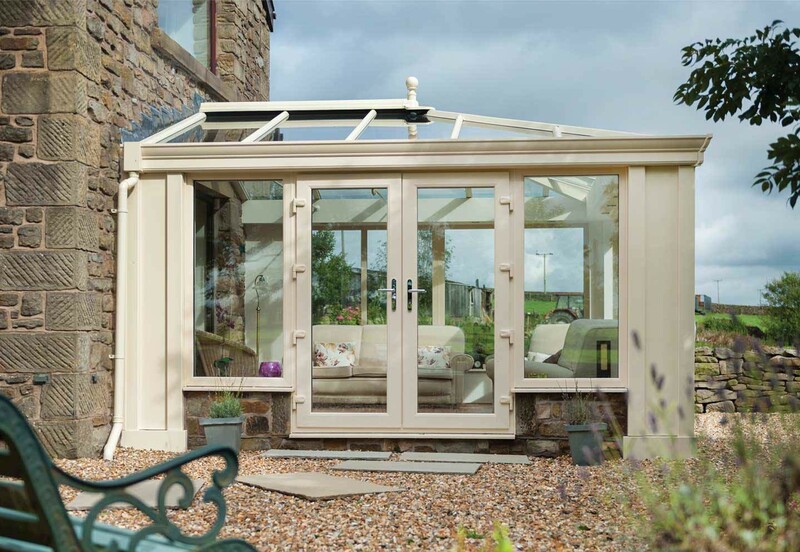 Over the years we have developed our orangery range to include every option in terms of finishing and styling, so you can be sure it meets your design needs – whether it’s a traditional or contemporary look you’re after. Every detail is governed by your requirements: from the lighting and interior finish to the exterior colour and detailing. Despite its name, the Quantal Orangery is flexible enough to suit a range of home improvement aims. If you’re planning on building an extension to your home, you’ll be able to achieve this too when you choose this market-leading product. The Ultraframe Classic Orangery is characterised by masonry, which is often used to demarcate the frames and doors. Internally, the walls and ceiling pelmet are plastered, which helps create a comfortable room like feel. The addition of a Quantal aluminium roof adds a contemporary twist to the Classic Orangery, perfectly blending tradition with modernity. The large glazed area above your new room will invite in plenty of light and create a sense of space. Ultraframe’s Glass Extension resembles an orangery, thanks to the inclusion of super insulated columns or masonry piers. Combined with a Quantal aluminium roof, the room feels spacious instead of enclosed and looks stunning. Thanks to the inclusion of some innovative and market-leading technology – and a unique system that makes installation quick and simple – a Quantal aluminium orangery will reward you with a superb style that’s designed to last. Because it's easy to assemble and install, your new space will be ready for you to use sooner than you’d first imagined. This means it won't matter what you choose, you'll be able to get it with ease. Comfort is delivered in generous measure, thanks to the superb thermal performance of the Quantal orangery roof system. The strong aluminium used to form its structure is externally and thermally sleeved, which contributes to the creation of an environment that’s the perfect temperature all year long and 24/7. Chambers built into the roof of the orangery work with box gutter foam insulation to further enhance heat retention, while also preventing the unwanted build-up of condensation. You’ll also be offered the option to include trickle ventilation at eaves level, which will provide you with an additional source of air to combat damp. Will the design of your new orangery include bi-fold doors? Create an almost threshold-wide portal, ventilate your space with plenty of fresh air and connect your home to your garden – these are just some of the benefits bi-fold doors will bring when you ask your installer to fit them into your new Quantal orangery. Your orangery will fully support the addition of bi-fold doors. The Quantal Bi-Fold Eaves is capable of creating openings up to 4.3m in width; it is compatible with both polycarbonate roofs and double glazed sealed units. Bi-folds of this width will be able to accommodate 4 or 5 panels, resulting in superior views of your garden. While the performance of your Quantal Orangery is important, you want it to stand out for the right reasons. Whether you pursue a classic route of design – by including more masonry and less glass – or want to create a garden room that’s light centric, the Quantal Orangery system will deliver aesthetic appeal throughout. Our Approved Ultra Installers are well versed in the installation of our Quantal range, which means they will be able to offer you the perfect style to suit your property. Whether you're looking for a sleek new addition or one that holds a more softer appearance, we'll be able to help you find the ideal option for you, your property and your tastes. The Quantal Aluminium Orangery’s ability to retain heat will depend on a range of factors, such as the types of windows, doors and glazing used in its design. When it incorporates the Ultraframe Livinroom system, the Quantal Aluminium Orangery could achieve a U-value of 0.6, which exceeds the maximum recommendation defined by the Passivhaus Institute. Your Quantal Orangery will be protected by a bona fide 10-year manufacturer’s guarantee from Ultraframe. The accredited UltraInstaller you choose for the work will be able to supply further information about the level of cover included in your product.